The biggest takeaway from Midnight Sun is that Patrick Schwarzenegger has a bright future as an actor. Fair warning: he's not a buff bodybuilder like his father, Arnold, so don't look for him to play he-man roles any time soon. 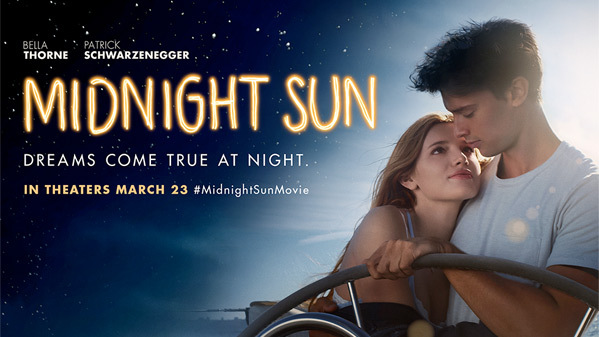 However, in Midnight Sun he proves that he can hold his own as a leading man in a romance drama. So, he ought to have a certain appeal to females, between an endearing vulnerability and his rugged good looks. 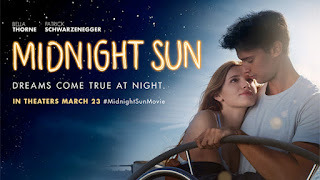 Directed by Scott Speer (Step Up Revolution), Midnight Sun is loosely based on Taiyo No Ita, a Japanese tearjerker released in 2006. This English language version is basically the same story, except for a few tweaks of the script that don't alter the arc of the basic plot. The title hints at the sickly heroine's affliction, Xeroderma Pigmentosum (XP), a rare skin disease that leaves her extremely allergic to sunlight. Consequently, Katie (Bella Thorne) is only allowed to leave the house after dark. Otherwise, she's your typical teenage girl. She enjoys music, keeps a journal, and has a crush on Charlie (Schwarzenegger), the tall, handsome neighbor who skateboards past her specially-treated windows everyday. They're both seniors at Purdue High, but he has no idea she even exists, since Katie completed all her schoolwork online. Their paths finally cross one evening soon after graduation when she was hanging out alone at the local train station, playing her late mother's acoustic guitar. It's love at first sight for Charlie, but Katie doesn't want to frighten him off by telling him she has XP. They start dating and everything is peachy keen until the night they stay out almost until daybreak. Katie freaks out and is forced to share her big secret. Will Charlie bolt or stick around? That is the critical question at the heart of Midnight Sun. The movie earns such high marks for its sensitive handling of a seriously-ill patient's heartbreaking plight that I was willing to forgive its relatively-sappy portrayal of the star-crossed lovers. A sentimental soap opera guaranteed to make you weep in spite of yourself.